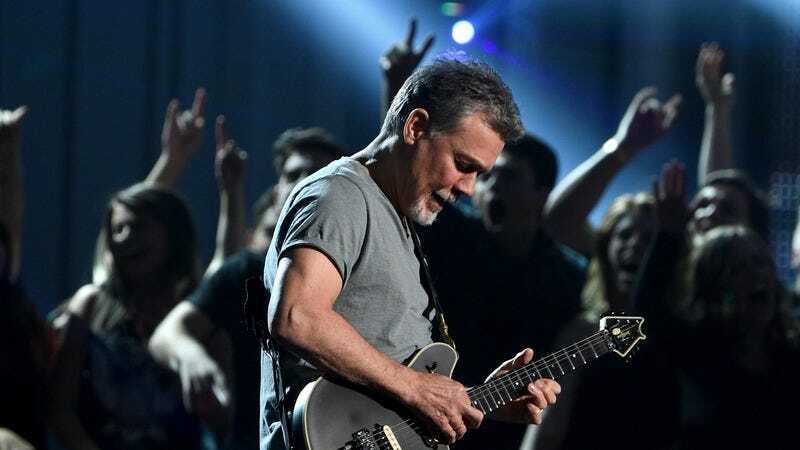 In a move that’s tantamount to saying getting shot in the heart is dangerous because it can give you lead poisoning, longtime smoker Eddie Van Halen is saying holding metal guitar picks in his mouth gave him tongue cancer. That assertion comes from a fairly provocative interview the rocker did with Billboard, during which he both says he never listens to music and dishes on all of Van Halen’s myriad lead singers, from Gary Cherone to David Lee Roth. In the interview, Van Halen says that holding “brass and copper” guitar picks in his mouth “in a recording studio that’s filled with electromagnetic energy” gave him cancer in the early 2000s. He’s since been declared cancer free, but it’s also worth noting that he also admits that, around the same time he was diagnosed, he was “smoking and doing a lot of drugs and everything.” He also says that the whole “guitar picks and magnets gave me cancer” thing is “just [his] own theory,” but that doctors have told him “it’s possible.” Your move, MythBusters.